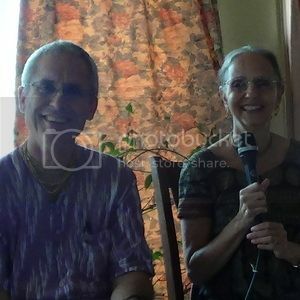 MAKING MARRIED LIFE AN ASHRAM THROUGH THROUGH WORSHIP OF THE FORM OF KRISHNA, SAINTS, AND THE HOLY NAME: I devoted a previous blog to the power of Deity worship in general and some of my experiences being a temple pujari for so many years. 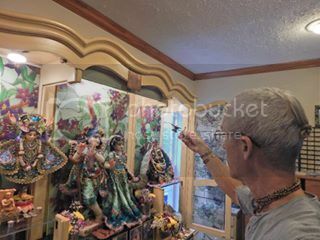 Today, after I dressed our Gaura and Nitai, and beheld the other Deities, all recently worshiped and adorned with new dresses and ornaments, as I chanted, I felt both awe and inspiration that these forms of Krishna and his expansions and energies have allowed us to live with and serve them. I was appreciating how for a householder, regular worship of Deities and seeing them as the true owner and enjoyer of our home and lives, is one way we transform our home into an ashram. We have a simple home standard where we offer them everything we eat two or three times a day, and dress and bathe them once a week, while the shilas are worshiped daily, though also simply. I have reasoned that our real worship is through our daily chanting of the holy name through japa and kirtan, offering our prayers, and ultimately our very life and soul, which is the point of everything we do. Saranagati, or surrendering our body, mind, and soul and all that we possess for divine service, or bhakti, is the process of spiritual awakening. Surrender is a loaded word, and we naturally feel it means we have to give up so much, lose so much. However paradoxical it may seem materially, it is by surrender that we gain our soul and true spiritual nature. Thus in that sense, by surrender we receive everything desirable for the soul, who we in fact are. 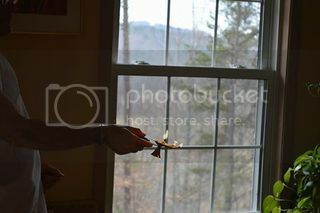 The things or relationships in this world only have true meaning because we put ourselves in them by projection--mine. We are the offering. We are on the altar of sacrifice. Our false conception of self is meant to be sacrificed, [false] “ego death” as it were, so the real self can emerge through the process of bhakti. Thus we invoke the mercy of the Lord gradually, step by step, which will fully manifest in his good time. 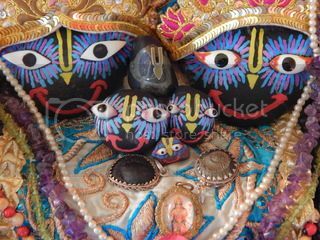 We put the Deities on an altar above us, and we bow down to them, offering prayers, and the holy name, and meditate on being their das or dasi, servant of the servant of the servant, by the grace of our gurus or divine teachers, as well as other Gaudiya Vaishnavas. 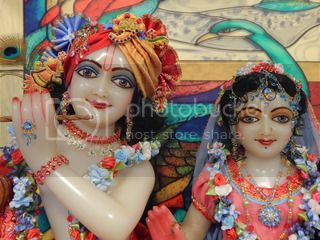 Our lives, homes, possessions, and relationships all become transformed by the process of bhakti and the loving devotion for Krishna and his devout that naturally arise. Deity worship, reading and thinking of the meaning of scriptures, chanting the holy name, and associating with, hearing from, and serving sadhus are some very powerful ways of personal transformation, and through them, our homes become ashrams, or place of spiritual practice, and even places of pilgrimage.